Hobbit is a fast replacement for the Big Brother monitoring/alert system. There were some ways to handle SNMP traps with Big Brother, but none that I could find that worked with Hobbit. (I hope I haven't reinvented the wheel....) I'm running all of this on the same computer. I got the idea after reading an article on integrating SNMP traps with Nagios in Sys Admin. I just adapted it to Hobbit. Snmptrapd is configured to feed SNMPTT the OID and hostname of the sending SNMP agent (I haven't tried working with SNMP proxies...). SNMPTT then translates the OID into a text message based on the MIB description for that OID and logs the message in /var/log/messages (or where ever you put it). You can also configure SNMPTT to log to a MySQL database simultaneously. There's a PHP script listed below that you can use to query it. SEC monitors the /var/log/messages file for entries from SNMPTT. Since some equipment can send the same trap multiple times in quick sucession, SEC is configured to ignore duplicate messages for a second or two. SEC then launches a wrapper script that sends Hobbit a message using Hobbit's BB client program. I won't go into detail how to configure and install each package; so, definitely read the documentation for each one. You'll probably find other uses for them. Be sure to adjust the path names as needed. Just compile and install this package. You might have it depending on your distribution. Your device may have a MIB file on it too. It's usually buried in the web management interface somewhere. After installing the package, you'll need to convert MIB files to snmptt.conf files. The SNMPTT manual mentions using the snmptranslate command from the Net-SNMP package to verify that a given MIB file can be parsed correctly. The --net_snmp_perl option creates long description sections with detail about all of the possibile variables for a given OID trap. Using it is optional. Don't be supprised to get warning messages about "can't translate/find OID" in the "errors" file. It's telling you that some of the MIB files require other MIB files that you don't have. You can ignore the warnings, track down all of the required MIBs (by reading the problem MIB file), or only translate the MIBs that pertain to your equipment. I've noticed that the APC and Dell MIB files have a SEVERITY definition in them. 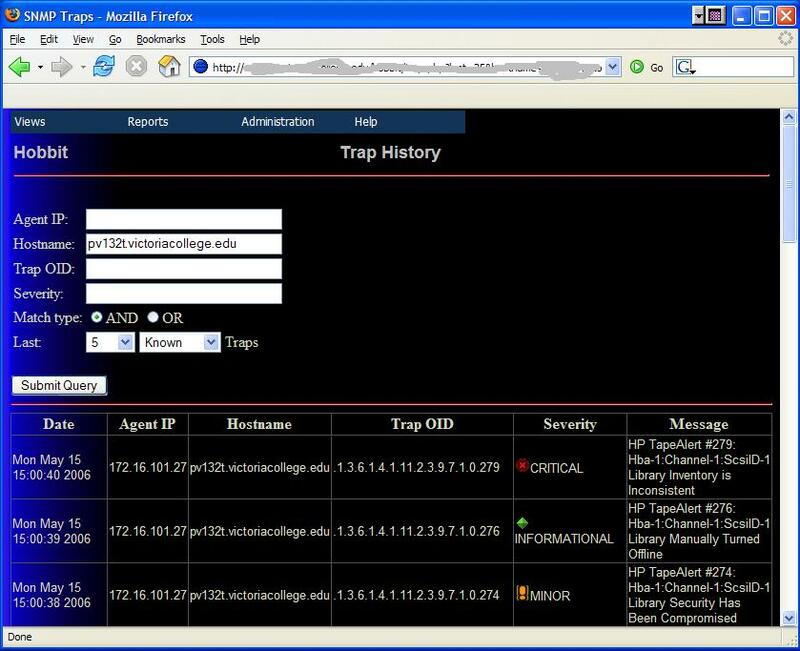 SNMPTT uses that to establish the severity for each trap (Normal|INFORMATIONAL|SEVERE|WARNING|...). However, I've noticed that Cisco and Canoga Perkins don't have those definitions; so, every trap event is considered Normal. You'll need to change the severity for the various traps as desired in the snmptt.conf file. Copy your various snmptt.conf. * files to /etc/snmp. The default settings for the /etc/snmp/snmptt.ini file are fine. If you run snmptt as non-root, make sure it has permission to read/write log files where indicated. I've listed what I use: /etc/snmp/snmptt.ini. I used the SNMPTT MySQL setup instructions to create the MySQL databse. action=shellcmd /home/hobbit/server/ext/trap.sh "$1" $2 $3 $4 "$5"
action=shellcmd /home/hobbit/server/ext/trap.sh "$1" $2 Unknown $3 "Unknown trap"
I made the trap.pl script so it can be used by both SEC (which processes the trap) as well as Hobbit (which runs it to keep the trap column from going purple). You'll need to rename the file to trap.pl since the file is called trap-pl.txt so your web browser can view it. Copy trap.pl to /home/hobbit/server/ext and make it executable. Make sure the path to perl is correct in trap.pl. You need to install Text::Autoformat from CPAN for trap.pl. The wrapper script, trap.sh, is called by SEC when it processes a trap. It uses Hobbit's bbcmd in order to setup the proper environment variables. $XYMONDIR/bin/xymoncmd --env=$XYMONCFG $TRAPCLIENT -C -s $3 -t $4 -d "$1" -m "$5 ($2)"
The trap.pl script is run from Hobbit every 5 minutes from hobbitlaunch.cfg. If you setup SNMPTT to log to MySQL, you can use the trap.php script to query the SNMPTT log database on your MySQL server. Copy the trap.php script to the hobbit/www directory. You will also need to enable USE_SNMPTTSQL in trap.pl. Don't forget, the Cisco MIBs don't have a SEVERITY set for any traps. You'll need to update the snmptt.conf file for your Cisco equipment to change the SEVERITY status for the OIDs you find interesting. Q: I'm not seeing traps appear in the trap column in Hobbit. What's wrong? A: Trap.pl matches the hostname as it appears in both the /var/log/messages log file and in bb-hosts. Do the hostnames for the traps in the /var/log/messages file match the hostnames as they are listed in the bb-hosts file? Fixes are either to update DNS or /etc/hosts. If the snmp log entries list IP addresses, trap.pl is not smart enough to look for IP addresses in bb-hosts. If you have just hostnames in the bb-hosts file (not FQDN) and the hostnames in the log file are FQDN, they won't match up.